Batterworks has the usual desserts like carrot cake, chocolate fudge brownies and cupcakes, but what makes them stand out is its range of savoury pastries such as roasted pork in flaky pastries, and curry flaky pastries. There is also a dine-in menu which offers inexpensive savoury food. You can find main courses (S$4.50 – S$6.90) like lamb stew pot pie, chicken bulgogi wrap and pulled pork wrap. If you are looking for a cafe to park yourself to do work, we know the place to go. Cozy Corner Coffee provides free wifi and power sockets. Get yourself a cappuccino and you are all set to go! One of the pioneer cafes in Everton Park, Grin Affair offers a range of mousse cakes (S$6 – S$6.50) that are made with fresh cream, and served in jars. Flavours include lychee with passion fruit, strawberry with cream cheese, cookies & cream, hazelnut, and matcha azuki. The cakes are not particularly fanciful, but we love them because they are comforting and rustic – the kind that you can spend your afternoon with over a cup of tea. Just Want Coffee is the place to stop by for your caffeine fix for those who are working in the area. This coffee bar first started in Johor Bahru in 2009, and the Everton Park outlet is its first venture in Singapore. It serves an impressive selection of brews made from house blends and single-origin beans. Cakes are also available to go along with your cuppa. Another pioneer cafe at Everton Park, Nylon Coffee Roasters is a gem for coffee lovers, and the place to go for a quality cup of coffee. This specialty coffee shop sources, roasts and brews amazing coffee beans from around the world. They are the experts and we should all pay homage to coffee together with them. 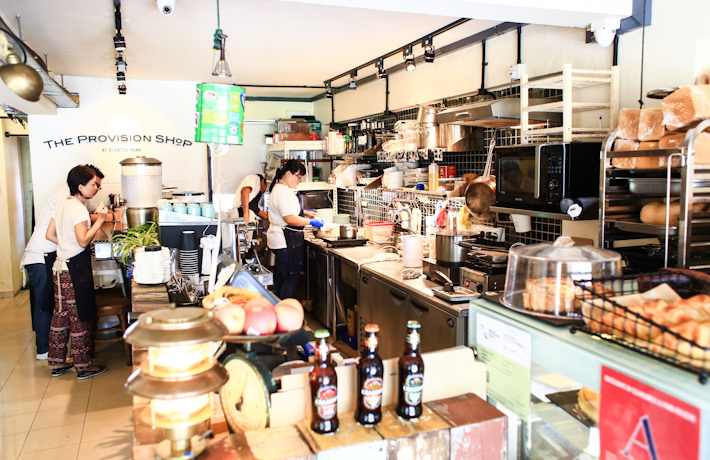 Nylon Coffee is listed in our guide to Singapore’s best coffee shops. Strawberry shortcake, mango passion fruit cheese mousse, lemon meringue tart, matcha cupcake, chocolate souffle, macarons… The Audacious Cakery showcases a range of beautiful cakes and pastries which are freshly baked on site. Time for some sugar rush! The latest addition to the Unlisted Collection Group, The Provision Shop is a new venture by Cocotte’s head chef, the group’s general manager, and operations manager, with hotelier Loh Lik Peng taking a consulting role. It is a casual eatery which dishes out simple yet delicious meals at affordable prices. Some dishes that are worth trying are Reuben sandwich (S$10), eggs Benedict (S$10), and the homemade pastas (S$14 – S$16). Remember to save room for desserts, too. We love the blueberry lemon cake (S$6.50)! The latest addition to the Everton Park neighbourhood, The Redundant Shop is a lifestyle concept shop that curates a selection of magazines, books, accessories and merchandise from independent labels. Walnut Tree deserves a mention for serving inexpensive Korean food such as kimchi fried rice (S$10), seafood pancake (S$10), ramyeon (S$8) and gimbap (S$7). For Walnut Tree, if I’m not wrong, they only serve cook food during lunch hour. but parking is an issue…. Directly Facing Blk 6 Everton Park, there is a BIG Multi-Storey Carpark and there is a link bridge to go there.